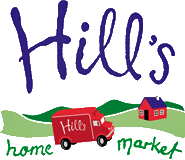 Welcome to Hill’s Home Market! Established in 1924 as a family owned butcher shop in Milford, Massachusetts, the company pioneered the concept of home food delivery in the 1950’s as Hill Food Service. Today, Hill’s continues to thrive in a busy world where people are short on time yet not willing to compromise on quality when it comes to feeding their family! Now celebrating our 89th year in business, Hill’s Home Market continues to be New England’s choice for busy families who want the convenience of home food delivery. Hill’s specializes in restaurant quality, All-Natural custom cut meats, poultry and seafood, frozen foods, natural foods, brand-name groceries and household supplies. Our unsurpassed customer service saves you time and stress. Your personal culinary consultant visits you at your home to assist you in developing an menu based on your family’s needs and preferences. Our Hill’s Home Market Unconditional Guarantee gives you peace of mind, knowing that you are receiving safe, nutritious meals for your family. If you are unhappy with a products, simply Contact Us and we’ll take care of it, free of charge. Still wondering how it really works? Visit the How It Works page. It’s so easy to get started!